"Grilled salmon and brown pasta works for me every time." - Steven Gerrard. "If I had the choice between smoked salmon and tinned salmon, I'd have it tinned. With vinegar." - Harold Wilson. "I am not a fine chef, but I can certainly get dinner on the table for 14 people. With that many, I try to keep it simple: salmon, mashed potatoes, sauteed spinach, and salad." - Cindy Crawford. "Thinking about lunch. Smoked salmon with pedigreed lettuce and razor-sharp slices of onion that have been soaked in ice water, brushed with horseradish and mustard, served on French butter rolls baked in the hot ovens of Kinokuniya. A sandwich made in heaven." - Haruki Murakami. SALMON is the common name for several species of fish in the family Salmonidae. Other fish in the same family are called trout. The difference between salmon and trout is sometimes said to be that salmon migrate and trout are resident, and that salmon spawn once and trout spawn many times, though these distinctions are not always strictly true. Salmon live along the coasts of both the North Atlantic (the migratory species Salmo salar) and Pacific Oceans (half a dozen species of the genus Oncorhynchus), and have also been introduced into the Great Lakes of North America. Salmon are intensively produced in aquaculture in many parts of the world. Typically, salmon are anadromous: they are born in fresh water, migrate to the ocean, then return to fresh water to reproduce. However, populations of several species are restricted to fresh water through their lives. Folklore has it that the fish return to the exact spot where they were born to spawn; tracking studies have shown this to be true, and this homing behavior has been shown to depend on olfactory memory. Salmon is one of the world’s healthiest foods. A serving of salmon, which is source of Omega-3 fatty acids, can reduce high blood sugar levels, aid weight loss, and improve your mood and sense of well-being. Salmon can also increase overall brain efficiency, enhancing your memory and keeping you alert for longer. Eating salmon helps to reduce the risk of heart attack, enhances the digestive system and reduces the chances of certain cancers. Having a much lower mercury content than white tuna, salmon is also an excellent source of protein for older people and essential component of any healthy diet. SMOKED SALMON is a preparation of salmon, typically a fillet that has been cured and hot or cold smoked. Due to its moderately high price, smoked salmon is considered a delicacy. Although the term lox is sometimes applied to smoked salmon, they are different products. GRAVLAX is a Nordic dish consisting of raw salmon, cured in salt, sugar, and dill. Gravlax is usually served as an appetizer, sliced thinly and accompanied by hovmästarsås (literally steward sauce, also known as gravlaxsås), a dill and mustard sauce, either on bread of some kind, or with boiled potatoes. For a Silkier Salmon, Turn Down the Heat - "Cooked under low heat, fillets, imbued with fennel and lime, become velvety soft, almost like a confit (in half the time, and with a lot less oil)." Gravlax recipe - Jen Reviews. Salmon, Two Ways: One Epic, One Everyday - The New York Times. 2 Sisters Alaska Seafood - "Seafood Delivered Direct From Alaska." AGROITTICA - Norwegian and Scottish smoked salmon. BALIK SALMON - "Considered by most aficionados to be the best smoked salmon in the world." BIEN MANGER - "French gourmet food and gifts." Salmon & smoked salmon. CASPIAN CAVIAR - "Suppliers of the finest range of caviars & gourmet foods to the great and the good." Coldpoint Seafood - "Buy Salmon Online." DEAN & DELUCA - "Purveyors of Fine Food & Online Gourmet Suppliers Since 1977." Fine Food Specialist - since 2012. "Buy Fine Foods & Specialty Items." Flavoursome salmon has to be one of the most versatile gourmet foods available. Serve it up before lunch or dinner, or enjoy it as a melt in the mouth main. What's your particular preference, though? If only whole salmon sourced from one of the finest producers in the UK will do, Fine Food Specialist can meet your specific requirements, with ease. Gourmet Food Store - "Norwegian & Scottish Smoked Salmon." Online store. 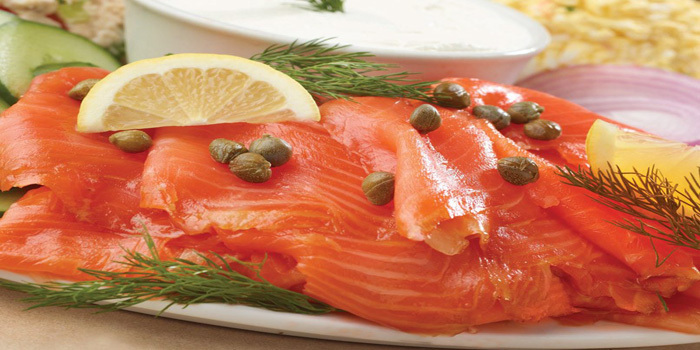 Great-Alaska-Seafood - Wild Salmon, Smoked Salmon online. Hansen & Lydersen - since 1923. "We smoke salmon the true Norwegian way." We source our salmon from a sustainable farm in the extreme wilderness between the Norwegian Sea and the North Atlantic, and ensure we prepare it less than 48 hours after it has been fished. IGOURMET.COM - "Buy Smoked Salmon Online." Island Seafoods - "Buy Salmon from Alaska: Fresh & Wild Caught." KASILOF FISH COMPANY - "Gourmet smoked wild Alaska salmon." KING'S FINE FOOD - "Purveyors of fine foods." Online store. Lobster Place - since 1974. Smoked salmon. Maison Glass - New York since 1902. Smoked salmon. Marky's - International Food Emporium since 1983. Smoked salmon. Norwegian & Scottish. Gravadlax. PETROSSIAN - "Exquisite Food and Gifts Since 1920." Online store. Pike Place Fish Market - "Fresh Salmon, 100% Sustainable!" ROSSINI - "Fillet Rossini. Norwegian Salmon." For fillet Rossini only the fine piece of fillet from the back of the salmon is used. The fillet is salted by hand and smoked in the old-fashioned manner for 20-28 hours in smoke ovens with beech sawdust, as was the custom 50 years ago. Seattle Fish Company - "Wild Sockeye Salmon Fillet." Buy online. Tanner's Fresh Fish Processing - "Buy Alaskan Salmon Online." Shipped fresh & free. Vital Choice - "Wild Seafood & Organics." WILD ALASKA SMOKED SALMON - "A tasty treat! Smoked fish from Wild Alaska Smoked Salmon are always wild caught and prepared fresh that day. Be prepared for the best quality chinook, sockeye, pink and coho salmon available outside of Alaska." Wild for SALMON - "Buy Wild Alaskan Salmon." Wild Pacific SALMON - "Wild Alaska Salmon, Chinook, Coho, Sockeye Salmon and Smoked Salmon."